Fall River, MA – Saint Anne’s Hospital has announced that it has earned national Gold Seal of Approval® certification by The Joint Commission for its spinal surgery program. The only hospital in Massachusetts to earn this specific national certification, Saint Anne’s spinal surgery program underwent a rigorous on-site review in October. A Joint Commission expert evaluated the program for a range of criteria, including compliance with consensus-based national standards; effective and consistent use of appropriate, evidence-based clinical practice guidelines for caring for patients undergoing discectomy, laminectomy, and spinal fusion; and performance measures specific to the spinal surgery patient population. Saint Anne’s Hospital launched the state’s first navigation-guided, robotic-assisted spinal surgery program in December 2017. 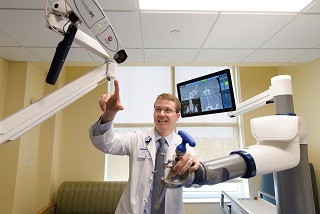 Its Globus ExcelsiusGPSTM system is the first technology in Massachusetts to pair robotic-assisted technology with a GPS-like navigation system, similar to that in a car, to guide the surgeon in performing spinal procedures. Prior to surgery, images are taken and fed into the system to create a “map” of the patient’s anatomy. During surgery, this map and live pictures act as a guide in helping the surgeon maneuver a rigid robotic arm to the exact location for precisely placed implants. Michael Bushell, president of Saint Anne’s Hospital, said that the Joint Commission’s certification of its spine surgery program is recognition of the hospital’s commitment to provide high-quality spine care. The hospital’s Spine Center provides a range of advanced, coordinated care for conditions of the neck, back and spine. Some of these include failed back syndrome, neuropathy, nerve entrapment or nerve injury, vertebral compression fractures, disc herniation, spine fractures, spinal tumors, and spinal stenosis. Depending on a diagnosis, patients’ options can include physiatry (physical medicine), pain management, physical and occupational therapy, and/or neurosurgery. A nurse navigation program ensures that patients are seen by the most appropriate specialist, right from the start. Learn more about the program at https://www.saintanneshospital.org/spine. In addition to this new certification, Saint Anne’s is the only hospital in the Greater Fall River-New Bedford area, and one of just 42 in the nation, to be honored for patient safety by The Leapfrog Group for consecutive “A” Hospital Safety ScoresSM since the program’s inception in 2012. In addition, the hospital was recently named as one of 35 US general hospitals as a 2018 “Top Hospital” for quality and safety by The Leapfrog Group. This was the hospital’s second consecutive annual Top Hospital award. A member of Steward Health Care, Saint Anne’s provides nationally recognized patient- and family-centered inpatient care and outpatient clinical services to patients from surrounding Massachusetts and Rhode Island communities. Saint Anne’s key services include Center for Orthopedic Excellence; multiple robotic-assisted surgical capabilities, including orthopedic surgery, spine surgery, and general surgery; Saint Anne’s Hospital Regional Cancer Center; two ambulatory surgery centers; the Center for Pain Management; and inpatient geriatric psychiatry services. Follow us on Facebook, Twitter, and LinkedIn.